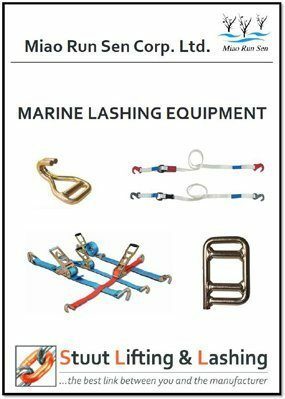 Here you can get our catalogs with all marine lashing products -technical data and drawings included- of our Chinese manufacturer. Please start the pdf-download with click on catalog-covers or on buttons below. If you have further questions or want to know more about our Stuut Lifting & Lashing agency please do not hesitate and contact us via phone or e-mail. Miao Run Sen Corp. Ltd. is a leading Chinese manufacturer of Tie Down Hardware and Cargo Control Products. The company´s sales office is located in Nanjing and the factory in Jiangsu. Qingdao Yuedasite Rigging Co. Ltd. is a professional rigging manufacturing company, founded in 1990 and located, near Qingdao, China.